Nissan Patrol Y62 Series is the largest and most expensive off-road wagon ever made by the Japanese giant, a giant with a long history in the 4WD and SUV fields. Listed from $82,690 to $114,490, the latest Nissan Patrol is competing against upmarket vehicles such as the Toyota LandCruiser Sahara, Lexus LX570, and even the Mercedes-Benz GL-Class. Though the Patrol is aimed squarely at the upper luxury SUV market, the company that’s been building serious 4WDs for decades has made sure it’s capable of handling serious off-road conditions and has a 3500 kg towing capacity. This big Patrol comes in three grades. The entry-level ST-L and mid-spec Ti are each eight-seaters while the flagship Patrol Ti-L is a seven-seater with increased comfort levels. Standard in all models are Bluetooth phone and audio streaming; large format front DVD player; a 2GB hard drive music server with six speakers; USB connectivity; and steering wheel audio controls. The $114,490 Patrol Ti-L gets satellite navigation; surround-view monitor; separate seven-inch DVD screens in the rear of the front seat headrests; a memory function for the driver’s seat, steering wheel and door mirrors; centre console cool box; Bose audio with 13 speakers. The big 6.5-litre petrol V8 engine delivers up to 298 kW of power, and an impressive 560 Nm of torque; 90 per cent of that torque is there at just 1600 rpm. With that much grunt the new Patrol can make the 0-100 km/h sprint in just 6.6 seconds. Many cars can’t get off the line what quickly. In the real world where zero to 100 sprints aren’t exactly the norm all that grunt is very useful for making light of hills, as well as spending as little time as possible on the wrong side of the road where overtaking. There’s no turbo-diesel option, primarily because the big Patrol is aimed at the American and Middle East markets where petrol is cheap and money is plentiful. In Auto mode the 4WD system has a torque split between the front and rear wheels on a 50/50 variable basis depending on road surfaces. There are 4WD-High for semi-serious off-road conditions and 4WD-Low for the heavy-duty off-road stuff. Four terrain options are available: Sand, Snow, Rock and On-road at the touch of a button as are hill descent control and rear differential locks. Nissan Australia has been smart in keeping the somewhat-aged turbo-diesel Patrol Y61 Series on the market alongside its bigger brother for those who want a workhorse (and can’t afford close to $100,000). There’s plenty of interior space and the sort of comfort levels that you expect from a high-grade people mover. 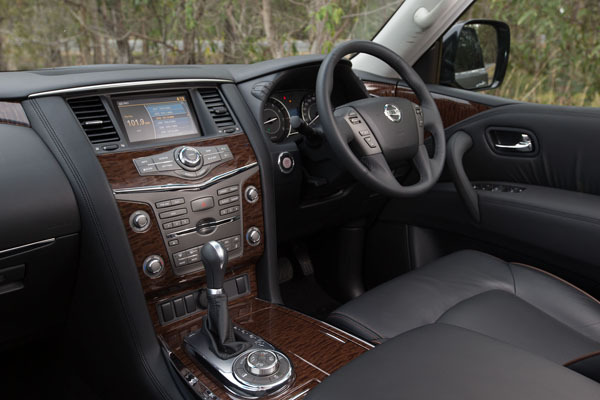 Spend up big and you get such features as wood grain finishes, an upmarket dash layout and high quality trim throughout. The big advantage of a vehicle of this size is that even with all three rows of seats occupied there’s still 550 litres of storage space. Folding the second and third row seats gives you a van-like 3100 litres, that’s made even more practical as it has a virtually flat floor. The powered rear cargo door is operated by a button on the key fob. On the road the big V8 engine is beautifully quiet and smooth, a throaty V8 burble under heavy acceleration is a joy to the ears of those who like old-fashioned grunt. Fuel consumption is listed at 14.5 litres per 100 kilometres on the combined cycle. During our test period we were able to get it down into the tens in easy country running, but around town the high teens were much more likely. Handling is enhanced through Nissan’s new Hydraulic Body Motion Control (HBMC) on the suspensions of Ti and Ti-L models that use hydraulic cylinders to minimise body roll. As this is claimed to be an off-road vehicle we took it into steep bush tracks with deep ruts, rocky ledges and steep climbs and drops. 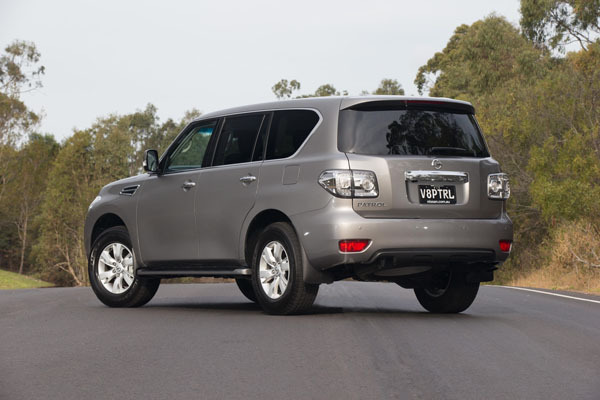 All of which the big Nissan Patrol absorbed with ease. 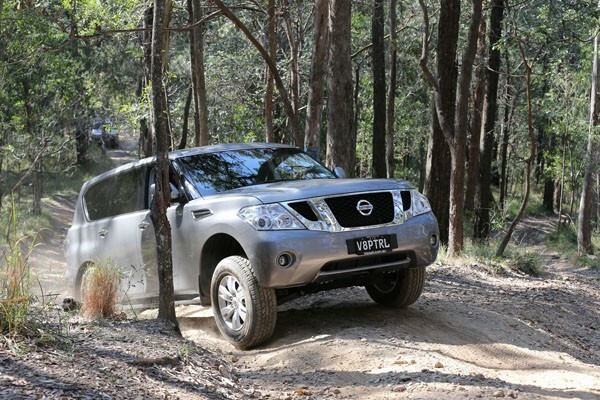 Nissan Patrol’s size makes it a challenge when parking, and can be a nightmare in cramped carparks. There are a number of parking aids such as a reversing camera, all-round parking sensors and an around-view monitor. Rugged, yet refined is Nissan’s sales slogan for the big Patrol Y62 and it really does sum up this giant SUV wagon beautifully. Note: These prices do not include government or dealer delivery charges. Contact your local Nissan dealer for drive-away prices.